Understanding the answer to this question will help you understand why we feed cows the way we do. Cows are ruminant animals. This means that they have 4 stomachs, the Rumen is the first compartment and this is the powerhouse for their digestive system. When a cow chews its cud, it is chewing small balls of softened food. The chewing action helps to secrete saliva which contains an antacid. This process aids in digestion. Cattle have two requirements for nutrition: Water and Energy. Energy can come from many different sources. The majority of their lives, our cattle enjoy a diet of hay grown at our farm, corn silage grown and processed in Massachusetts, and a vitamin and mineral mix. 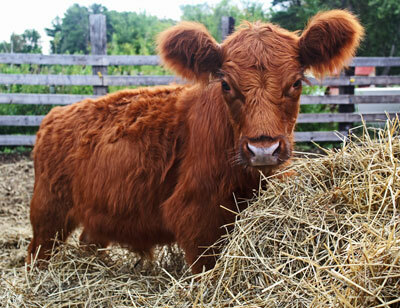 All ruminant animals require what is called forage or roughage (hay, grass, etc.). These foods give them energy and help to maintain their internal body temperature. Corn silage is just a fancy word for corn and cornstalks that have been harvested and fermented. Corn silage has a high moisture level and is very digestible for cattle. It also provides a lot of energy which is needed in the cold winter months in New England. Our beef cattle are also given cracked corn for the last 3 months before harvesting. This helps to ensure a well marbled (and tasty) meat! Hubbard's Farm beef animals are separated by age. They all enjoy the fields and barns year round. They are free to go in and out as they please. Our animals are not routinely given medications, but if one is sick we ensure it receives the proper treatment to heal and recover. You can purchase our farm-raised beef at our Farm Store in frozen variety and individual packages, in limited quantities. If you are interested in purchasing beef from us, please contact us. The Farm Store hours are listed on the footer at the bottom of this page. Refer to our handy charts below to learn about how to identify and cook or grill specific cuts of beef. For more on cooking beef, visit the Beef Checkoff website. Hubbard's Farm beef is also now available at Mountainside Market at 23 Hubbardston Road in Princeton.